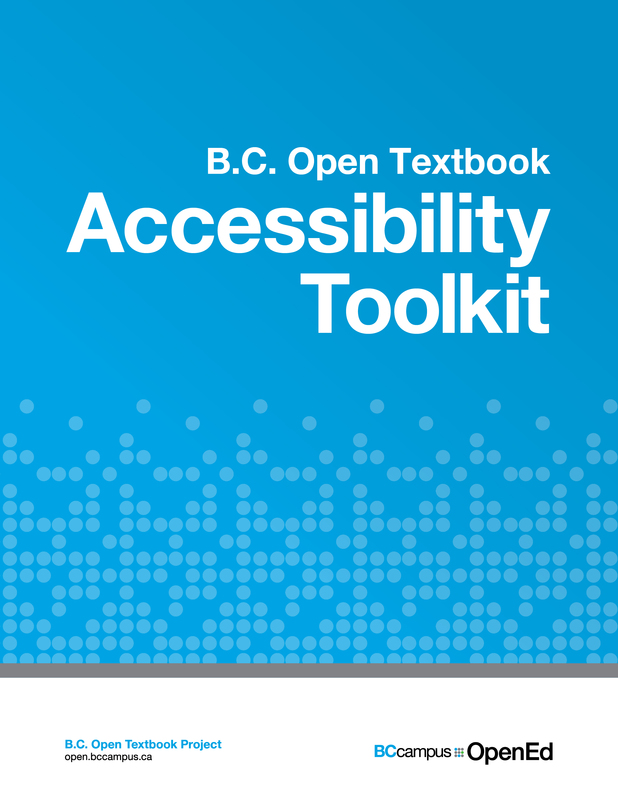 Last week we published The BC Open Textbook Accessibility Toolkit. I’m really excited and proud of the work that we did and am moved by how generous people have been with us. Since last fall I’ve been working with Amanda Coolidge (BCcampus) and Sue Doner (Camosun College) to figure out how to make the open textbooks produced in BC accessible from the start. This toolkit was published using Pressbooks, a publishing plugin for WordPress. It is licensed with the same Creative Commons license as the rest of the open textbooks (CC-BY). This whole project has been a fantastic learning experience and it’s been a complete joy to experience so much generosity from other colleagues. We worked with students with print disabilities to user test some existing open textbooks for accessibility. I rarely get to work face-to-face with students. It was such a pleasure to work with this group of well-prepared, generous and hardworking students. Initially we were stumped about how to get faculty, who would be writing open textbooks, to care about print disabled students who may be using their books. Serendipitously I came across this awesome excerpt from Sarah Horton and Whitney Queensbury’s book A Web For Everyone. User personas seemed like the way to explain some of the different types of user groups. A blind student is likely using different software, and possibly different hardware than a student with a learning disability. Personas seemed like a useful tool to create empathy and explain why faculty should write alt text descriptions for their images. Instead of rethinking these from the beginning Amanda suggested contacting them to see if their work was licensed under a Creative Commons license that would allow us to reuse and remix their work. They emailed me back in 5 minutes and gave their permission for us to reuse and repurpose their work. They also gave us permission to use the illustrations that Tom Biby did for their book. These illustrations are up on Flickr and clearly licensed with a CC-BY license. While I’ve worked on open source software projects this is the first time I worked on an open content project. It is deeply satisfying for me when people share their work and encourage others to build upon it. Not only did this save us time but their generosity and enthusiasm gave us a boost. We were complete novices: none of us had done any user testing before. Sarah and Whitney’s quick responses were really encouraging. This is the first version and we intend to improve it. We already know that we’d like to add some screenshots of ZoomText and we need to provide better information on how to make formulas and equations accessible. It’s difficult for me to put work out that’s not 100% perfect and complete but other people’s generosity have helped me to relax. I let our alternate format partners across Canada know about this toolkit. Within 24 hours of publishing this our partner organization in Ontario offered to translate it into French. They had also started working on a similar project and loved our approach. So instead of writing their own toolkit they will use use or adapt ours. As it’s licensed under a CC-BY license they didn’t even need to ask us to use it or translate it. Thank you to Mary Burgess at BCcampus who identified accessibility as a priority for the BC open textbook project. Thank you to Bob Minnery at AERO for the offer of a French translation. Thank you to Sarah Horton and Whitney Quesenbery for your generosity and enthusiasm. I really feel like we got to stand on the shoulders of giants. Thank you to the students who we worked with. This was an awesome collaboration. Thank you to Amanda Coolidge and Sue Doner for being such amazing collaborators. I love how we get stuff done together.